Social worker, politician and professional football player Emery Barnes spent much of his life helping the disadvantaged in society and working for worldwide human rights and world peace. 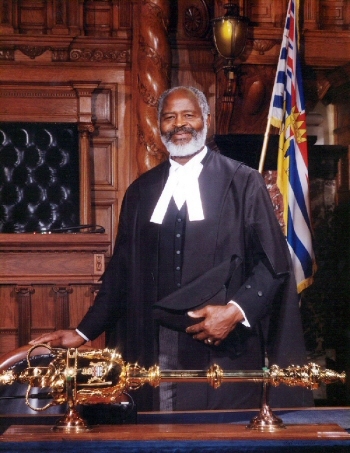 Barnes was first elected to the British Columbia legislature in 1972 and was elected Speaker of the Legislature in 1994, serving in the provincial legislature until 1996. He was the first black person to hold the position of Speaker in any Canadian province. Barnes was born in New Orleans, Louisiana on December 15, 1929. At the age of 12 he and his family moved to Oregon. During his high school years in Oregon he became an outstanding athlete, excelling in high jump, track and field. He was an alternate high jumper for the 1952 U.S. Olympic Track and Field team. He also played football at the University of Oregon, where he earned a Bachelor of Science degree. In 1954 he was drafted by the National Football League (NFL), to play for the Green Bay (Wisconsin) Packers. After a relatively short NFL career he moved to the Canadian Football League and the British Columbia (B.C.) Lions in 1957. During Barnes’ football career, he did post-graduate studies in Social Work at the University of British Columbia. In 1964 he began a career as a social worker in Vancouver until he entered politics in 1972. Barnes and fellow New Democratic Party legislative assembly member Rosemary Brown were the first black candidates elected to a legislative office in British Columbia. They were part of a political coalition that formed the first social democratic government in British Columbia. Barnes political platform was dedicated to helping the disadvantaged, with an emphasis on worldwide human rights, social justice and poverty. At one point in his political career, realizing how difficult life was for many of the people in his district and wishing to bring attention to poverty in the area, he moved to downtown East Vancouver and limited himself to living on an amount equal to that received by welfare recipients. When the British Columbia Black History Awareness Society first emerged in 1993, in an attempt to acknowledge Black History Month, Barnes obtained a government grant and rallied community support for the Society. He then led the effort to build a cultural community center in Vancouver for the entire community but especially to serve the people of African heritage. Through his hard work and diligence the BC Black Cultural Association was formed with Barnes as the first president. Barnes was appointed to the Order of British Columbia in 1995. After a short illness that led to his death in 1998, the City of Vancouver has named a park in his memory: Emery Barnes Park at 1100 Seymour Street. The British Columbia Black History Society, A Resource Guide on Black Pioneers in British Columbia (Victoria: The British Columbia Black History Awareness Society, 1997); Lorraine Murray, "Reflections on Emery Barnes," http://www.darrenduncan.net/archived_web_work/voices/voices_v1_n3/emery_barnes.html.